Recycled Plastic Wood Eco Friendly Bracelet from Africa, "Butterscotch Connection"
With the ecology in mind, Rita Addo Zakour selects sese wood disks to combine with elongated beads crafted of recycled water bottles. 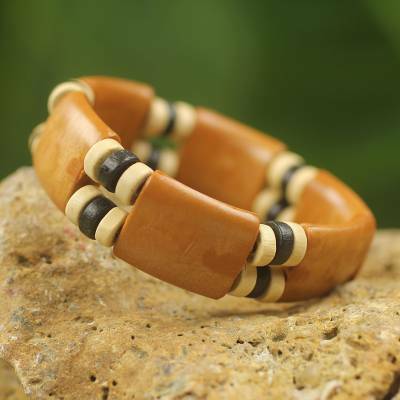 She crafts a delightful stretch bracelet in tones of golden brown, black and cream. You can find wood stretch bracelet 'Butterscotch Connection' by Rita Addo Zakour in jewelry categories such as Eco-Friendly Bracelets, No Stone Bracelets, Wood Bracelets, Plastic Bracelets and Stretch Bracelets. Enjoy exploring these sections for other Novica treasures. Rita has three children. Two of them are currently in the university and one studies in a vocational school. Rita Addo Zakour has received 6 microcredit loans with 0% interest from Kiva and Novica, the first for $400 and the most recent for $2050. Proceeds were used to purchase raw materials such as wood and paints. "I do my designing with African concepts in mind." "I am a designer by profession. I do my designing with African concepts in mind. Growing up, I loved to sketch things on paper. It was a natural talent, I guess. In high school, I pursued a course in visual arts that helped me develop my natural talent; this made my art studies enjoyable. "I then attended a secretarial school, and stringing beads helped me generate income to my support my education. I sold the beads to friends and students, and their comments encouraged and motivated me to create more designs. Over time, I made more to sell in the local market. "After completing the secretarial course, my bead-craft became very demanding and I focused my attention on it. I also got into carving as well as developing frame designs for mirrors. "I started out by creating a lot of designs and worked with a carver to translate my sketches on wood. I started painting them and added the metal plates. I got lots of positive comments on my work, which encouraged me to continue and not give up. "I'm blessed to be married to a man who is also into arts and crafts, and is a designer as well. We work together. It's wonderful to work in such an environment where a simple design can turn out to be something very unique product through the input of my spouse. This makes my products very unique from other artisans making similar products. "I find inspiration by opening my eyes wider to see things — in magazines, on TV, on the streets, and all around me. "Requests for my designs led us to build a workshop at home and have proper supervision of the work. The carvers who collaborate with me use traditional tools. As the demand grows, I'm able to give work to more carvers, which generates more income for them and their families. I sometimes have young men in the community showing an interest in learning how to carve, and they come around to observe. It is possible one or two carvers who show a keen interest can make a career out of this. The workshop also provides local women with a constant supply of wood scraps for cooking. I'm proud to say that, on few occasions, I've chipped in financially to help a couple of children in my neighborhood. These children see me as their second mother and it is a joy to put a smile on their faces. "With the introduction of my jewelry through Novica, women who mainly enjoy stringing beads in the neighborhood also get to earn some money when there is an increase in demand. We use mainly wood, recycled aluminum sheets and recycled plastic beads. "Away from work, I love to be with my family and cook for them. It is such joy having three young ladies at home. With their love for fashion, they help out with stringing the jewelry, sharing their opinions on my designs and also suggesting color combinations for some of my jewelry. My beautiful twins are so interested in the jewelry. They are likely to take up the craft as a full-time profession in future. I commit to teaching them all the skills I've learned. I train and encourage my children to follow their passion just as I followed mine. My hopes and dreams for them is that they can be educated to the highest level and that they find and get established in their passion, and I hope to be a part of this dream by carefully guiding them. "I am hardworking, loyal, organized and religious person, and I believe my friends or family would say the same about me. I live by this philosophy, to focus on the positive, not on the negative, and to never give up." Rita Addo Zakour has a fine sense of style. an artistic eye and ecological integrity, using many recycled materials to create many of her designs. I Love the necklace and earrings I own! Today I received the Praises necklace and coordinating earrings that I ordered from Rita. I was so impressed by both of them! The stones on the necklace are smoothed and lay comfortably against the skin. The center accent is beautifully done and matches the earrings extremely well. The earrings are large and bold while being comfortable in weight. I absolutely love both of them! These are just the earrings to make a bold impression!